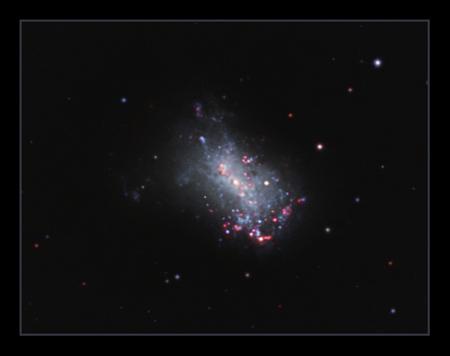 NGC4449 is an irregular dwarf galaxy and part of the Canes Venatici cluster. It's about 12 million light years away and is very similar to the large Magellanic cloud, one of the satellite galaxies of the Milky Way. Radio emissions tell us that the visible galaxy is actually surrounded by a cloud of gas 14 times the diameter of the galaxy we can see. There are areas of active star formation, which are the reddish pink areas in the image. It was discovered by William Herschel on April 27th, 1788. R,G,B & Ha all binned 2x2. Total imaging time- 7 hrs 15 minutes. Imaged on the 7th, 8th & 9th of April 2011.